It was Sunday 7th Nov. 2010, the rain God – Varuna temporarily stopped the downpour of water after many days of incessant rainfall , the sun God – Surya came out in full splendour and spread His blanket of bright sunshine , and Sydney residents in their thousands (estimated to be more than 20 thousand) came out to Parramatta Stadium in their bright coloured dresses, caps and turbans to celebrate one of the most memorable and deeply moving Deepavali Fair in Sydney organised by Hindu Council of Australia for 12th year. It is memorable for a variety of reasons including the number of participants who turned up on the day, the large number of stall-holders, big and small, catering to mind and body needs of participants and the presence of large number of local and foreign artists who contributed to the success of the Festival. Westpac Bank. Hello Mobile and Western Union were the major sponsors of the event. Large colourful Rangoli in front of main stage, largest ever Raavan effigy, beautifully decorated Puja stage, huge undercover decorated stage, colourful stalls brought back memories of the traditional Indian fair ( Mela ). Variety of Indian food with chilled coconut water, sugar cane juice and ice cones filled the appetite of visitors throughout the days. Hon. 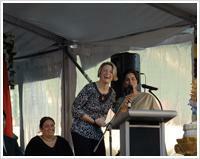 Kristina Keneally, Premier, NSW was the Chief Guest. Other guests included Mr. Barry O’Farrell, Leader of Opposition, NSW, Mr Amity Disrupt Indian Counsel General, Mr. Deepak Khaki Counsel General of Nepal, Mr Laurie Ferguson MP representing Prime Minister Julia Gillard, Senator Maries Payne representing Leader of Opposition Mr Tony Abbott, Ministers from NSW Government including Mr. Paul Lynch, Mr. David Borger, Ms. Virginia Judge, Mr. Peter Primrose and Ms. Barbara Parry; Ex Premier, NSW Mr Nathan Reese, Dy Lord Mayor of Parramatta Mr. Michael McDermott and many distinguished members from the community. Premier Kristina Keneally spoke on the importance of Deepavali for Hindu community and also recognised important contributions made by our community to NSW and Australia. 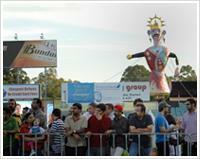 Mr. Barry O’Farrell also reiterated that Hindu community has positively contributed to NSW growth. One of the most memorable features of the Festival was the installation of largest ever (45 feet ) effigy of Ravana . It was built in Sydney by artisans Mr. Gulshan and Mr.Ravi, who came from India especially for this job. The mammoth task of assembly and erecting the effigy was done by a team of Mr. Ajay Khanna, Mr. Narayan, Mr Gurmail Singh, Mr. Ishwar Lamba and other with help of a special crane. 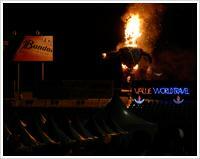 Effigy was fitted with special pyrotechnic effects and followed by biggest ever fireworks. The beautiful large rangoli was made by Sanjyot and Nilesh in front of stage despite the challenge of doubtful weather. The day was filled with full of spectacular cultural programs on main stage for full 8 hours. Program started with devotional music by Arya samaj Sydney followed by Gayatri mantra chanting by Gayatri Parivar group and Hare Krishna bhajans. Young kids showed their talent with Bollywood songs and dances. The people really enjoyed the steps of young kids. This segment was followed by live music entertainment by Saaz band with melodious songs by various singers. It was followed by fashion parade sponsored by Desi girl. high by presenting best professional dance groups like Kathak from Swastik dance group, Nepalese dance group, Balinese dance. One of the main attractions of the show was Ottam Thullal” a dance from Kerala where performer enacts all the characters in the story was performed by Ramdas and then it was followed by Oppana a Muslim wedding dance of Kerala. A new addition to the event was Western Union Deepavali Dance competition with cash prizes to promote local dance groups. 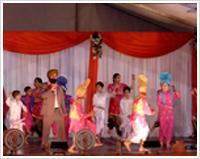 Ministry of Bhangra, Lotus school of dance and Indian dance school won first, second and third prize respectively. The quality of dance competition was second to none and the crowd enjoyed every moment of the dance competition. In the showcase event of fair was the folk troupe from Rajasthan of Rehmat Khan Langa who came all the way from India to entertain people of Sydney. This group entertained the people with their memorable dances and songs. Their uniques dances with multiple pots on head, swords, picking up rings with their eyes mesmerised the audience. This was just fantastic and cannot be expressed in words how much people enjoyed. The grand finale was done by Mr. Devinder Dharia and Rooh Punjab Di group with more than 24 participants in their colorful dresses which were based on Baisakhi festival. performed on the main stage of Deepavali mela and people commented that this was the best cultural program they have witnessed ever at one stage in Australia. 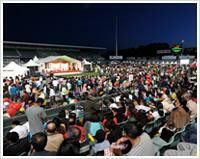 More than 18 groups from various parts of Sydney performed and entertained the people from 12 noon to 9pm. Another addition to this year Deepavali Fair was youth stage to run competitions and shows for youths. At youth stage there was puppet show. Sari wrapping competition, Pagri wrapping competition, Hello Mobile free mobile giveaways were conducted by Deepa, Abhishek and Sulabh. They entertained people with various activities like quiz and dumb charade. Thomas was the magician of the show and he pulled a big crowd with his magic tricks. During the day long event Hindu Council of Australia distributed freely many items such as 2011 calendar with Hindu dates, face masks, Bhagwat Geeta, Hanuman Chalisa and many Kids’ toys . Free face painting was yet one more major attraction. The dancing Elephant from Parramasala also kept enjoying he kids. Hindu Council also promoted community services like senior citizen forums, aged care service with Sriom care, organ donation with NSW government during the fair. Free health checks were performed on more than 300 people. The entry fee for the event was kept same as in previous years ( $5 only ). success of this event to the untiring efforts of volunteers – hundreds of them, young and old, men and women – who gave their time and labour in the true spirit of SEVA.